A Federal High Court in Abuja, on Wednesday, asked the Chief Justice of Nigeria to swear-in Vice President Goodluck Jonathan as acting president of Nigeria pending the return of President Umaru Musa Yar'Adua from Saudi Arabia. 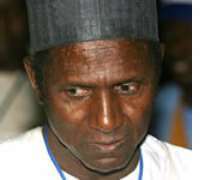 The ruling followed a case instituted by a lawyer, Christopher Onwuekwe, claiming that the absence of President Yar'Adua and his failure to handover to Mr. Jonathan as acting President are indications that there is no Head of government and that the situation is capable of threatening the existence and stability of the Federal Republic of Nigeria. Mr. Onwuekwe, through his counsel, Amobi Nzelu, said that since the president has not written to the National Assembly informing it that his Vice should oversee the affairs of the state pending his return, a way out of the situation would be for the court to empower Mr. Jonathan to exercise the powers of president pending Mr. Yar'Adua's return to office.